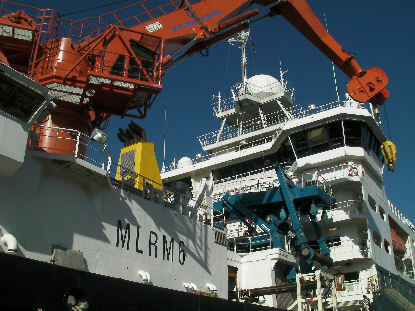 Each time the RRS James Cook comes into port, a team from the National Oceanography Centre, Southampton, visits to 'mobilise' the vessel for her next voyage. Mobilisation involves taking off equipment from the last expedition and setting up the equipment needed for the next. Expedition team members Bram and Veit have also started to assemble all the components of the HyBIS underwater vehicle, rousing out boxes of equipment from freight containers that have arrived from the UK. In the afternoon the biology team (Paul, Jon, Verity and Diva) headed into town in search of some more buckets for the samples that they hope to collect. The ship was well-supplied with buckets and sample containers when it left the UK in November, but the previous expedition - to deep-sea vents in the Antarctic - used nearly all of them.